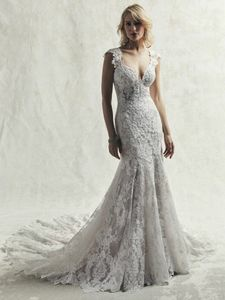 Description: An ultra-romantic lace wedding gown, this soft fit-and-flare features shimmering motifs atop textured tulle. Bodice features sheer detail along the waistline, with lace motifs completing the sheer cap-sleeves, illusion plunging sweetheart neckline, and illusion scoop back. Complete with petal-shaped train accented in lace motifs. Finished with two lines of covered buttons along a zipper closure.